Welcome to Day #2 of Chocolate and Halloween wEEK. Adults who grew up in the U.S. in the mid- to late-1900s celebrating Halloween by dressing up in ill-fitting costumes and going door-to-door for treats often ended up with a fat sackful of candy after a run through the neighborhood. Most parents now monitor candy intake more closely, but individually-wrapped chocolate candy bars are still a thing, even in petite form. This week begins with featuring more traditional candy bars and then veers into possible chocolate alternatives. Today's Boffo! Bar from Trader Joe's (Monrovia, CA) possessed all the traits and flavors of a classic candy bar. 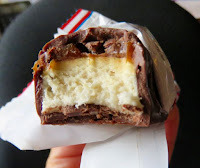 At its core, it contained white, fluffy nougat, covered by a layer of caramel and peanuts. And it was coated in milk chocolate. 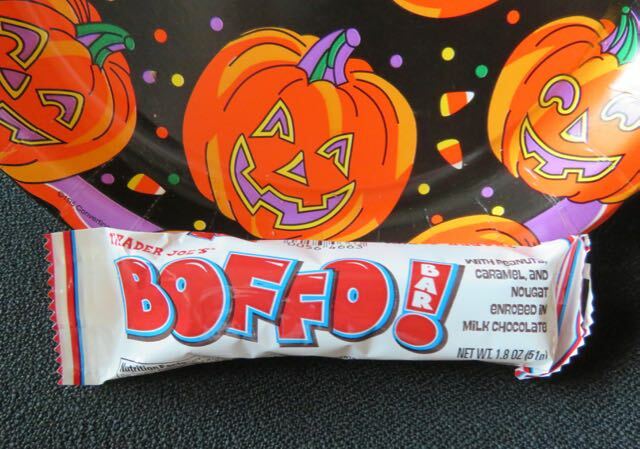 I do love the name "Boffo! "* It makes me wonder why this name hadn't been used before. *And speaking of the 1900s, Boffo is a term linked with a successful production (movie, play, event) and/or satisfying, deep laughter. Make sure to work this term into your comings and goings this week. People may look puzzled, but you'll all be the better for it. Note: In my haste, I missed that this bar does contain malted barley, and possible traces of wheat. So, gluten-freers should probably avoid this bar.